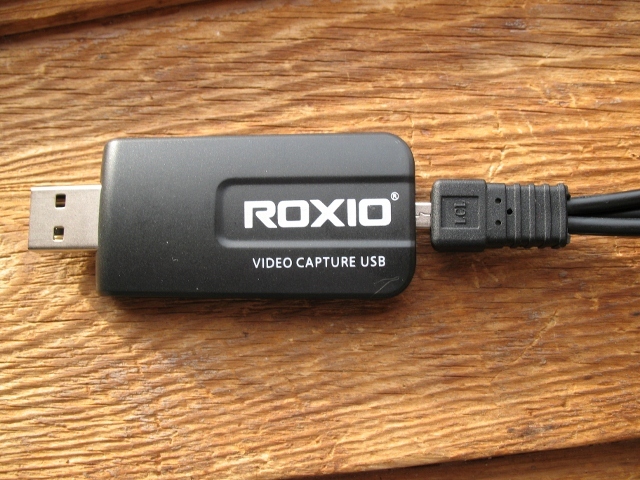 I purchased Roxio Creator 2012 and received a roxio video capture usb. I assumed that meant I could capture vhs tapes and convert them to dvd. Roxio Media Import status shows that I have NO SIGNAL. I have tried both compostie video and s-video and 2 different VCRs. And yes, the VCRs work when I hook them up to the TV. Is Roxio Creator 2012 capable of capturing vhs tape and converting it to dvd? If so what am I doing wrong? One thing that's given folks problems in the past has been plugging the capture device into a port on the front of your PC. Try plugging it directly into a USB port on the back of your PC. The shorter cabling seems to help in some cases. Do you get any image at all on the preview screen when you start playing the tape? Also, did you install the drivers before plugging the device into your PC? It's essential to install the drivers from the CD first, before plugging the device in, otherwise Windows installs the wrong drivers first. I plugged it into usb on back of my pc. Nothing. No, I do not get an image on the preview screen. Not sure what you mean by "drivers". I reinstalled my Roxio Creator 2012 cd yesterday. "did you install the drivers before plugging the device into your PC? It's essential to install the drivers from the CD first, before plugging the device in, otherwise Windows installs the wrong drivers first".? 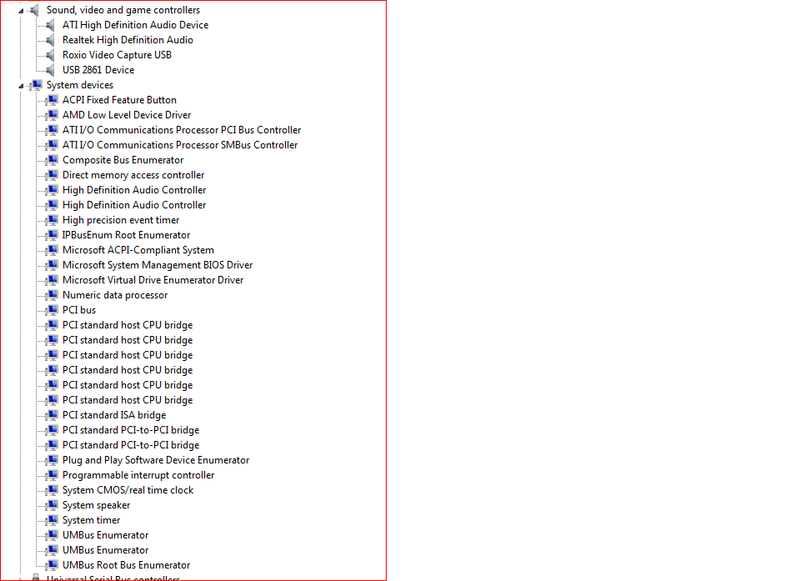 Yes, I did install the drivers before plugging into my PC. With the USB Device plugged into a USB 2.0 port open device manager and expand other devices and sound video and game controllers. Now grab a screen capture and post the .jpg image here. Hopefully these attachments will give you the info you need. I appreciate your help. You show the correct drivers installed! 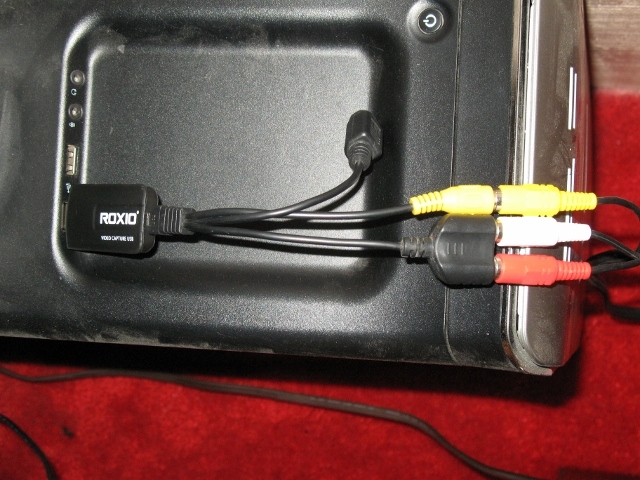 In detail explain your connections to the Roxio USB Device and your VHS player? You may want to update the drivers for your video device and audio device from the respective manufacturers. Don't trust Windows to do it right. I see that is a brand new driver for your ATI Radeon HD 5450 chip. I'm sure there is a new driver for your audio chip. Did you try plugging in another USB device such as a thumb drive, camera, camcorder or other to see if that USB port is functional? Picture of cables from my vcr. Very simple yellow video and white audio. 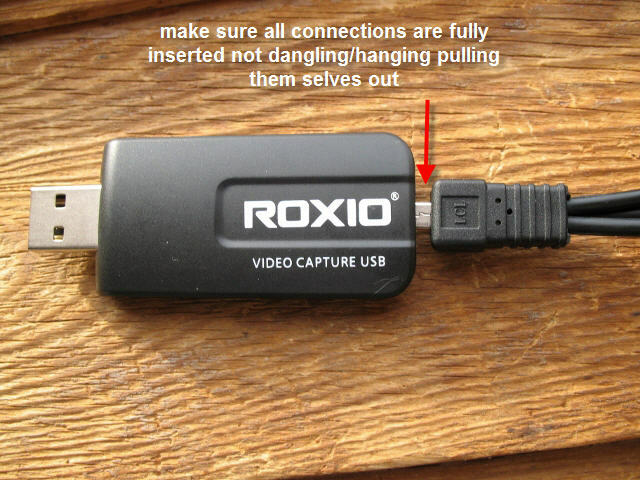 Picture of roxio capture USB into pc. 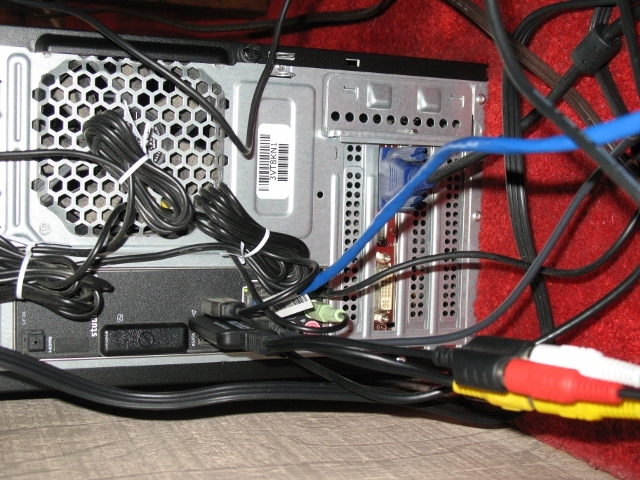 I have also tried using a USB port in the back of my pc. Screenshot of roxio media import window. You only show a left channel (white) audio? Where does the red go? Did you turn on the VHS and press pause so that the program can find the signal and get ready to capture? What VCR do you have? Make and model please. What are we looking at in your second picture (USB into computer)? The red audio doesn't have anywhere to go on this vcr. The vcr is a Curtis Mathes Model# CMV42002. Yes, the 2nd picture is usb into the pc. I just tried pausing the vcr so program could find signal, but that didn't work. To help prove the problem, try hooking up a Camcorder or DVD player as a test and see if that works. Interesting ! That Curtis Mathis unit is really made by Samsung ! Yes, you are using the correct jacks. If you don't have a manual, you can read it here. BTW, go to Radio Shack or other electronics store to get a Y connector. to take the single mono -output to split into two. 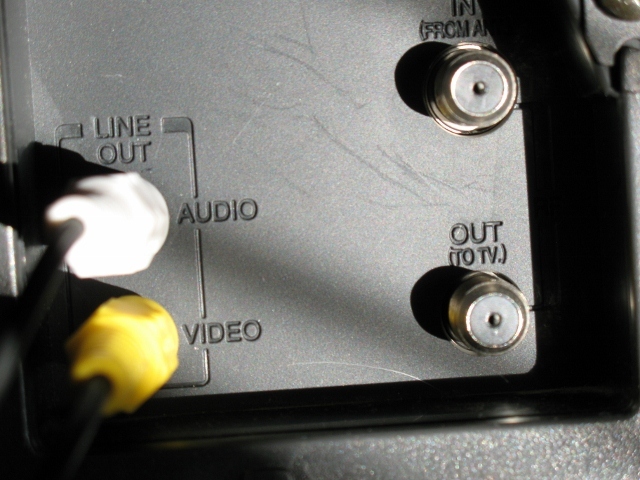 Use the two with wires to connect to the USB device so when you do capture, you have the same audio on both channels. It won't be stereo but it won't have everyone asking why you have audio out of the left ( or right) speaker. That power on button in your image is not usually on the back of your computer. Computer info, the rest can be found on post from January 31. This is the back of my pc. I have tried capturing from the front and back of my pc. I just tried to capture from a DVD player and it still shows no signal. I did this from the back of the pc. Not sure if this is an issue, but the cables going to my capture device don't seem to go in far enough. 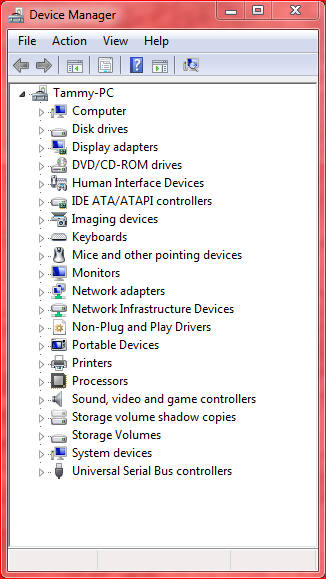 In Device Manager with the Roxio USB Device plugged in do your see a entry under other devices? Can you borrow another VHS Player from a friend? 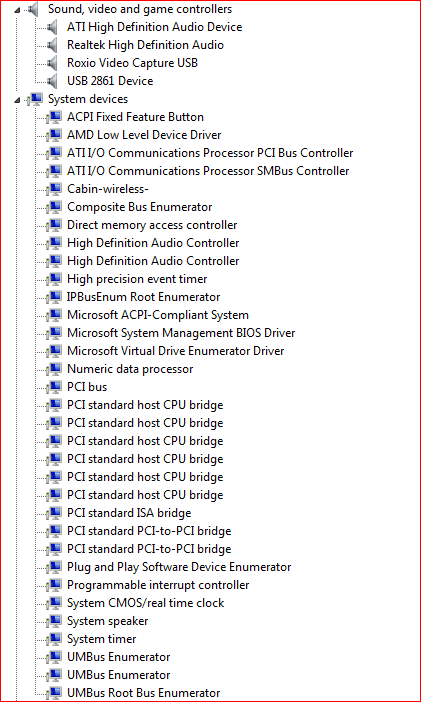 This is a screenshot of my device manager with Roxio USB plugged into back of pc. I can try to find a different vcr. That is not what cd asked. Excuse me for calling it a vcr. Yes, I can try to find a different vhs player! This is the question I need answered! That is not what I was referring to, sorry. This is also what cd asked: "In Device Manager with the Roxio USB Device plugged in do your see a entry under other devices?" I don't see anything about "other devices". Sorry for being so difficult, just frustrated. Thanks you, that is good and now we know your drivers for the Roxio USB Device are installed correctly. Does the device get warm to the touch when it's plugged into the PC? I have tried to push the connection in further, but it won't budge. What you see in the picture is as far as it will go. As cd says "that is good". The "other devices" entry usually shows up if a device has not installed correctly and the operating system cannot identify the device correctly.